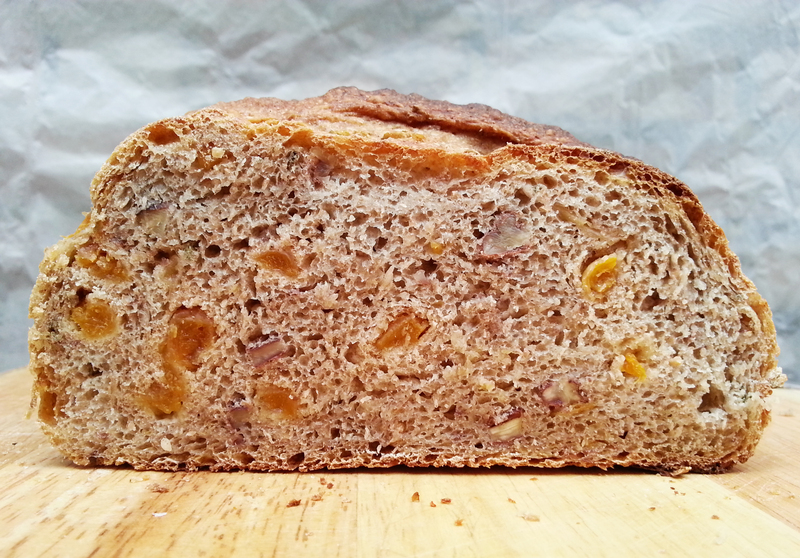 I have a go-to base recipe for a sourdough loaf inspired by The Wild Yeast, which is so reliable and has great flavour. I tweak the recipe by adding ingredients to create different flavour combinations. Sourdoughs require a lot of time and patience but the end result is always so rewarding. To ensure a good texture (soft, well-cooked interior, and a crunchy crust), technique is so important. The Wild Yeast has great instructions, and I would emphasise the most important points as being the presence of steam in the oven for a good rise, checking the internal temperature with a thermometer at the end of the bake (you don’t want all that effort to result in an undercooked loaf! ), and don’t cut the loaf until it is fully cool. Obviously, the flavour of your sourdough will depend on your starter and that is not always consistent, and this unpredictability is what I love about sourdough. Recently, in the warmer London weather, I’ve found that my sourdoughs have been tangier, which I will miss now that the weather is turning cooler. I love experimenting with flavour, so when I read about the combination of apricot and sage, I was fascinated. The floral notes from the sage pair very well with the sweet dried apricots. However, even though I used approximately 2 tsp of chopped dried sage (from my herb garden! ), the sage flavour was not evident enough for me. Next time, I might double the amount of sage. 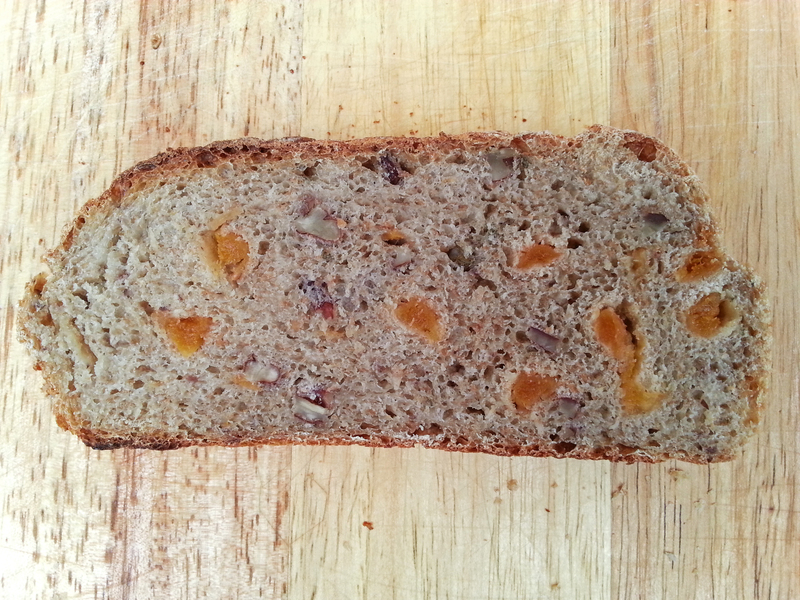 I love nuts and seeds in my sourdoughs, which provide texture and earthiness to the bread, so I added pecans. My parents (who are my current food critics) loved this flavour combination, and if they’re happy, I’m happy. I’m always on the lookout for new flavour combinations so if anyone has any suggestions, feel free to let me know! This recipe makes 2 large 1kg loaves – each loaf perfect for a family of 4. I usually freeze the other loaf. Add the salt, sugar, apricot, sage, pecans and continue mixing on low or medium speed until the dough reaches a medium level of gluten development. This took 6 minutes in my bread machine. Ferment at room temperature (~22C) for 2.5 hours, with folds at 50 and 100 minutes. Turn the dough out onto a lightly floured counter. Divide it into 2 pieces. I usually make two 1kg loaves, and freeze one loaf after baking. Shape into batards and place seam-side-up in a floured banneton or an oiled container. Cover with plastic wrap and proof at room temperature for 2.5-3 hours. Alternatively, the loaves can be proofed for about 2 hours at room temperature, then refrigerated for 2 – 16 hours and baked directly out of the refrigerator; this will yield a tangier bread with a lovely, blistered crust. Meanwhile, preheat the oven, with baking stone, to 240C. You will also need steam during the initial phase of baking, so prepare for this now. Turn the proofed loaves onto parchment. Slash each one with two overlapping cuts that are almost parallel to the long axis of the batard. Once the loaves are in the oven, spray the sides of the oven with water and turn the heat down to 230C. For 1kg loaves, bake for 15 minutes with steam, and another 35 minutes without steam. I cover the bread with foil after 25 minutes to prevent the crust browning too much. Nearer the end of bake, you can take the foil off if the crust is not dark enough. The crust should be a deep brown and the internal temperature should read 96c. Turn off the oven and leave the loaves in for 5 minutes longer, with the door ajar, to help them dry. Cool on a wire rack. Don’t cut until the loaves are completely cool, otherwise it will be sticky! This takes about 2 hours. 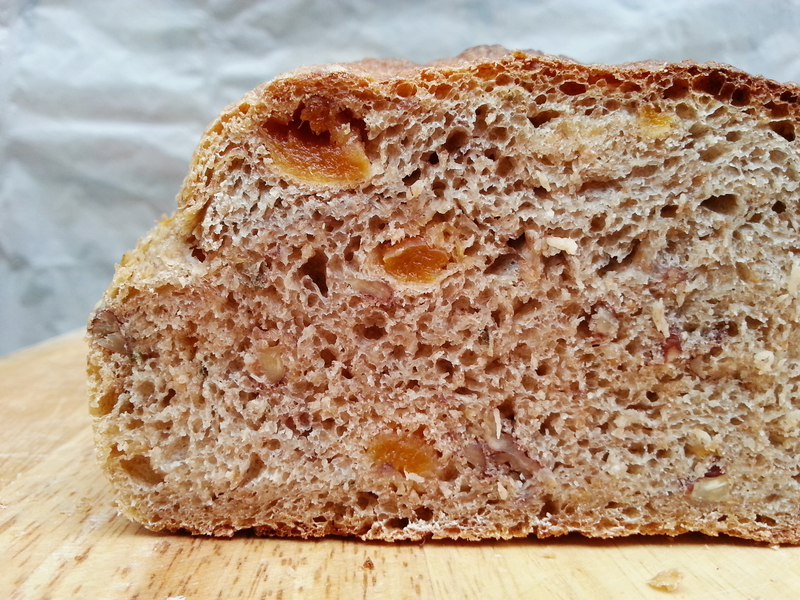 This entry was posted in Bread and tagged appetizer, apricots, baking, Betty's, bread, breakfast, herbs, loaf, pecans, recipe, sage, sandwich, sourdough, sourdough starter. Bookmark the permalink. This looks incredible. I’ve recently begun loving fruity bread. Thanks for sharing! !